Mendelevium (Md) was discovered in 1955 by a University of California-Berkeley team of Ghiorso, Harvey, Choppin, Thompson, and Seaborg by bombarding Einsteinium with helium ions. Because its half life is about 1.5 hour, it is unlikely to be produced in weighable amounts. It decays by electron capture to Fermium which in turn decays by prominent fission in a half life of about 3 hours. Its predicted eka-Thulium chemical behavior allowed separation as a +3 ion so that fission of only three atoms of Fermium was sufficient to identify the existence of element #101. The named was chosen to honor the Russian chemist Dmitri Mendeleev who first created the periodic chart. Dmitri I. Mendeleev (1834-1907) was born the youngest of 17 children in Tobolsk, Siberia. He was educated at the University of St. Petersburg (now Leningrad), published his thesis on the Union of Alcohol and Water , then studied in France and Germany. In September 1860 Mendeleev attended the First International Chemical Congress in Karlsruhe (Germany) where 140 prominent chemists met to sort out contradictory lists of atomic and molecular weights. The group failed to reach agreement on the issue. Afterwards Mendeleev visited the first oil fields in Pennsylvania then returned to St. Petersburg where he taught until 1890. While returning home, Mendeleev, like several other prominent chemists, realized that a syllabus distributed at the Congress by the Italian Stanislao Cannizzaro (1826-1910) demonstrated how Amadeo Avogrado´s hypothesis provided unambiguous atomic and molecular weights. Playing a solitaire-like game with cards each labelled with a chemical element, Mendeleev organized the elements into a table using the new atomic weights and their chemical combining power (valence). This first periodic table provided organization to inorganic chemistry. Trends he noted in families of elements caused him to believe that some atomic weights were erroneous, and permitted him to predict properties for empty positions on his table. 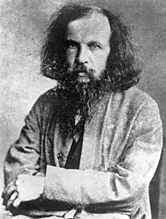 In March 1869 Dmitri Mendeleev published a paper on The Relation of Properties to Atomic Weights of the Elements. He proposed precise properties for yet undiscovered elements which he called eka-Aluminum (now #31), eka-Silicon (now #32) and eka-Boron (now #21) after expected similarities to Aluminum, Silicon, and Boron. Within two decades elements were discovered with properties closely matching Mendeleev´s predictions. These are now called Gallium (found in 1875) and Germanium (found in 1886), and Scandium (found in 1879). Mendeleev wrote Elements of Chemistry in 1868. Mendeleev´s periodic table rapidly became the basis for understanding elements and their compounds. Mendeleev made additional predictions: an element lighter than Hydrogen, and possible heavy elements. No element has been found lighter than Hydrogen and Moseley´s X-ray study suggests none is possible. Inadequate knowledge of the rare earths and artificially produced elements misled Mendeleev´s predictions about heavier elements. Mendeleev´s periodic table assisted and was complimented by the discovery of the entire noble gas family of elements. The current position of the actinides (and the artificially synthesized transuranic elements) was not established until Glenn Seaborg found elements #93 and #94 had unexpected solubilities. But the prominent German chemist, Lothar Meyer (1830-1895), also attended the First International Chemical Congress, realized the value of Avogadro´s hypothesis from Stanislao Cannizzaro´s paper, and created a similar table. Meyer wrote: I also received a copy which I put in my pocket to read on the way home. Once arrived there I read it again repeatedly and was astonished at the clearness... The scales seemed to fall from my eyes. Meyer included a periodic table in a new edition of his book Die modernen Theorien der Chemie (December 1869), but did not make predictions like Mendeleev´s. Both Meyer and Mendeleev believed the other had plagiarized. Eventually both came to realized that they had independently discovered the pattern in the elements. 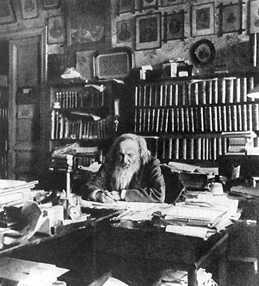 While an inspired teacher, Mendeleev resigned his professorship rather than obey an order to cease interfering with affairs of government. When as part of his attempts to modernize Russia, the Czar declared that all Russians should be beardless, Mendeleev defied the Czar's wishes and refused to cut his hair. Nevertheless, he won the appointment as Director of the Bureau of Weights and Measures where he worked out the standards for Russian units.